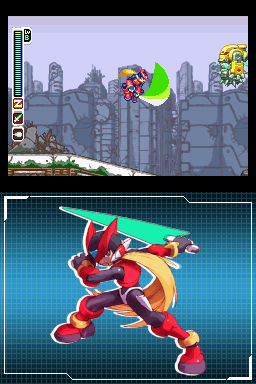 The Mega Man Zero series was a radical departure from both the Classic and the X games, bringing Zero into the spotlight. Gone was the typical Mega Man formula, and in its place lied a more linear story progression, lack of typical boss weapons, and the difficulty was ramped up even higher than before, but this doesn't necessarily mean that the Zero games were bad. Actually, they were quite the opposite. 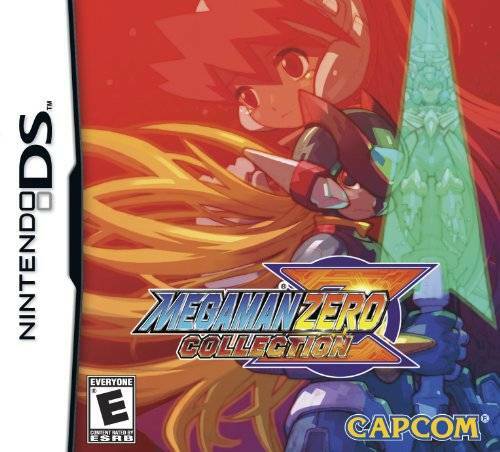 Thus, Capcom saw this and brought all four of the Mega Man Zero titles to the DS, continuing their tradition of compiling a series when it's over. Is it a worthwhile endeavor? Upon starting the collection, you're presented to a rather nice opening consisting of concept art from the series. Admittedly, it's a bit rough. It lacks fade-ins in some places where they could have been easily implemented, which would have made it look quite a bit more polished. Overall, it's nice, but nothing special. The menus, to be quite honest, don't look very good. They lack any sort of art other than the background, which is one of two: a completely black void, or a circuit ripped from Zero 4's save screen. They easily could have been done on the GBA -- and in fact, the collection makes almost no use of the lower screen. Three new things come to the collection, however: Wallpapers, Mod Cards, and Character Cards. Each is accessed via the "Collection" option on the main menu. Wallpapers are generally pointless pieces of concept art that are obtained by completing the four titles on the collection outside of "Easy Scenario" (which I will touch on later). These pieces are the same pieces that are displayed on the bottom screen during play, which is a nice touch rather than having a completely black filler screen. Mod Cards are a feature specific to Zero 3, which makes it feel like it's the main attraction of the collection. The Mod Cards aren't anything new, really -- they're repackaged versions of the Japan-only e-Reader cards that were sold for Zero 3. They apply several effects to the game depending on which one you choose, ranging from obtaining stronger weapons to cats roaming the Resistance Base. Character Cards are character profiles obtained by completing "Easy Scenario" (yet again, I will touch on later), which is almost the only reason to play on that mode. Now, for the meat of the collection: the games within. For playing the games, you have two options -- "Easy Scenario", which allows you to play through all the games in one large, interconnecting set, and the typical selection mode where you play each game separately. Easy Scenario is a huge disappointment; as the name indicates, it's severely gimped in the difficulty department. You have the effects of all of the Cyber Elves (this series' power ups) right at the start, as well as quadruple defense. It would have been much more satisfying to be able to select your difficulty for this mode. The other, much more preferable option is playing through the four games separately. The collection has not reduced their difficulty for this mode, thankfully, and there isn't really anything to lose as the Easy Scenario doesn't provide any transitions between games. The titles are presented in their original, un-stretched aspect ratio, which means that there are black bars along the top and bottom of the screen, and concept art is displayed on the bottom screen, varying depending on what weapon you are using and which boss you are fighting. New to the games is an awkward way to reconfigure the controls -- as they're simply emulated, there is no direct support for the DS's X and Y buttons. You have to map them awkwardly on the bottom screen. Instead of assigning them to specific actions, you choose which buttons they emulate. Overall, the collection is a nice way to enjoy the games, but if you already have at least two of them, it's a better option to pick up the other two games used. However, if you have a DSi, DSi XL, or 3DS, this is the best (and only) way to play these must-have titles.